If you have stopped to heat iron, do not hurry to throw it out. After all, the fault may be quite trifling. To correct an internal fault, the iron need to disassemble and inspect. In this article, we will consider the process of disassembly and repair of the iron in the details. The iron case is usually difficult to understand. First, open the back cover where the power cord connects. The slots of screws holding the cover, can be very different. It all depends on the manufacturer. Sometimes you have to undermine a screwdriver, needle files, so it will fit. After removing the cover, check the power cord. Ping it with a tester. You can also connect to the terminals on the iron cartridge with a bulb 220, and then insert the plug into the network. Lived often breaks the wires where the cord enters the body of the iron. Here follows a slightly shortened cord. If the plug and conductors of wires are OK, disconnect from the sole upper part of the iron to check the internal components. When disassembling the housing, you need to find all the screws of the fastener. They can hide anywhere. Unscrewing the mounting screws, engage the latches that need to press with a knife or screwdriver. Remember that what is attached and in what sequence. Otherwise you risk not to collect iron back or not collect in full. After completing all operations, separate the body of the iron from the sole. Check with tester heater (heating element, mounted on the edges of the soles), thermal fuse and thermostat. They are connected in series, so the problems should arise. If you have no measuring instrument, check the fuse and thermostat through their alternate circuit cut the isolated piece of wire, the ends of which needs to be stripped. Include at this time the wires to the socket, but do not forget about the danger of electric shock. To prevent this danger, you can, if you do not touch the live parts of the iron bare hands. In the extreme position the thermostat is open. It is included with a distinctive click while rotating. When you open contacts you can clean them with a needle file or strips of sandpaper. The irons usually blows the thermal fuse. And it can be short-circuited, the deletion of the electric circuit. Iron can work without a working thermal fuse, which is an additional protection in case the thermostat will be "sticky". 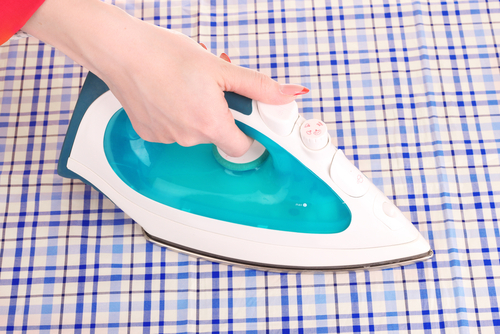 Only in this case do not forget to unplug the iron from the mains immediately after Ironing. And if the thermal fuse, the thermostat and the power cord is intact, the iron may be discarded or disassembled for parts.